My friend Elaine Luther is a woman of many many talents. You've seen her work featured here when we've devoted a month to metal clay. In fact, her resource list is one of my most oft-consulted links that I return to time and again since metal clay is something that I only occasionally play with. Well, Elaine has also compiled a wonderful resource for anyone who is dissatisfied with the state of their own jewelry photography. We all know it's tough to photograph those small shiny objects, but we hate to think about putting out big bucks to hire a professional. Elaine has advice for you to do it right all by yourself, and she even lists where you can get the materials you need. And...I think she's nuts...her booklet is only 99 cents! It is designed for a Kindle, but you can use the free version of the Cloud Reader and read it right on your desktop. 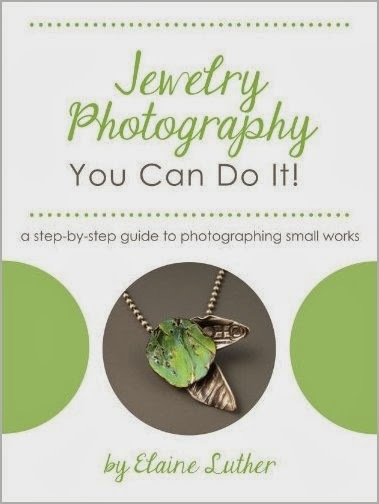 Check out Jewelry Photography: You Can Do It! by Elaine Luther.